It has happened again. Millions of homes across Michigan received bright, glossy, full color advertisements for a conference on Bible prophecy. The brochure promises a three day course on the end times followed by more studies in later weeks. The website promises to give the key to understand prophecy and to reveal secrets about coming world events. In less than a week the conferences will begin all across the state. Unfortunately the brochure and website give no information about the church or churches affiliated with the conference. The organization has carefully removed any specific information about the church affiliation of the sponsors. In those places the conference is being held at a church they have gone so far as to remove the full name of the church from the website. A little digging reveals that Unlock Revelation is a conference sponsored by the Seventh Day Adventist Church. The area sponsors are pastors and members of the Seventh Day Adventist Church. The presenters are Seventh Day Adventists and the teachings will be Seventh Day Adventist doctrine. The Seventh Day Adventist view of the end times is very similar to this author’s. Many within the Seventh Day Adventist church are genuinely born again Christians. Despite significant areas of correct doctrine the Seventh Day Adventist teaching is dangerous. The official doctrines of the Seventh Day Adventist church put it at odds with most of Protestant Christianity. The Seventh Day Adventist church reveres Ellen G. White as a prophet of God. They do not believe her words or writings are Scripture. Her writings are from God and are “inspired counsel concerning spiritual personal religion and the conduct of (Seventh Day Adventist) work.” (Questions on Doctrine) Their belief about Ellen White’s prophecies contradicts the Biblical description of prophets. The prophet of God uttered Divine revelation- “thus saith the Lord”- that was always accurate and always authoritative. They never gave “counsel”. They commanded because it was the Word of God. The Seventh Day Adventist church is not a reliable source of teaching about Scripture. Their errors make them a dangerous place to go searching for truth. Many in the movement are saved, and quite a few Seventh Day Adventists reject the errors of the denomination, but the official teachings of the church undermine the work of Christ, obscure the truths of salvation by grace through faith alone and hinder the believer’s confidence in the Word of God. Are the Sun, Moon and Stars Prophetic Signs? The recent solar eclipse in America and the four lunar eclipses of 2014-2015 led many to seek for the Biblical importance of these remarkable celestial events. One famous television pastor wrote a best-selling book about the role of the lunar eclipses in God’s prophetic plans. Some Bible prophecy teachers argue that the sun, moon and stars are given by God to warn of major events in the history of the world. This claim is based on Genesis 1:14, “And God said, Let there be lights in the firmament of the heaven to divide the day from the night; and let them be for signs, and for seasons, and for days, and years:” Since God put the celestial bodies in the sky as signs we should be paying attention when something unique happens in the heavens. God might be trying to tell us of an important event that is about to happen. Genesis 1:14 does not say God uses the celestial bodies to warn of future events. Just like in English the Hebrew word for sign has multiple meanings. The correct definition is determined by the rest of the sentence or paragraph. Genesis 1:14 says God put the things in the sky for four reasons: for signs, for seasons, for days and for years. The last three purposes are related to telling the time. The sun, moon and stars mark out the changing of the four seasons. The rising and setting of the sun marks out the days. The revolutions of the sun and the stars in the sky mark out the passing of the years. They are signs related to the passing of time not to omens and portents. In the Pentateuch, the five books written by Moses, a sign is a mark, token or memorial of something. The miracles accomplished by God when He brought Israel out of Egypt were signs. They were tokens of the great power of God that confirmed His promise to the Israelites that He would deliver them. The law of God was given to Israel as a sign reminding them they were the covenant people of God. The rest of the Old Testament uses signs predominantly as a reminder of something that happened or as confirmation a promised event is going to happen. When God promised to heal King Hezekiah He gave to Hezekiah a sign that confirmed what God had promised would happen. In the Old Testament a sign is always connected to a specific promise or event. A sign is never a vague portent of impending doom. An eclipse does not promise anything specific, nor can a single eclipse be connected to a definite promise of God. The signs of the Old Testament were attached to specific events or promises. The sun, moon and stars do not forebode the future. They are tokens of God’s faithfulness, continual reminders that He is Creator and unfailing memorials to His glory. Did God give Palestine to the Jews? Conflict has long raged in Palestine over the right of Jews to have their own kingdom in the Middle East. Most of the disagreement today is political and ethnic, but many Christians and religious Jews see the possession of Palestine as a Divine right granted to the Israelites thousands of years ago. 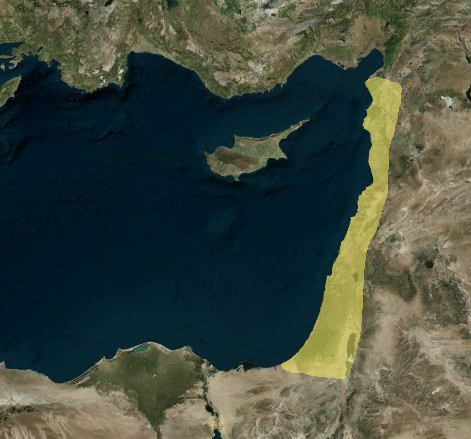 Did God promise to give the Israelites the land along the east coast of the Mediterranean Sea? After the exodus from Egypt God led the Israelites to the eastern border of the land of Canaan. He commanded them to go in and conquer the land He had promised them. If they would obey Him God would give them victory over the inhabitants. If they disobeyed God and turned to idolatry then the Canaanites and other nations would take Israel captive. Israel began to conquer the land. After early successes the nation fell into a vicious cycle of disobedience, captivity, repentance, deliverance and then disobedience again. As a result Israel conquered very little of the promised land until the time of David. Under King David and his son Solomon Israel took possession of most, but not all, of the land promised to Abraham. After Solomon’s death the kingdom split and began to dwindle. Israel has never held all of the territory promised to her by God. The history of the Israelites and the current political situation makes it seem unlikely that the Jews will hold all the promised land. However, God’s promises will always be fulfilled. When Jesus returns to establish His kingdom He will make Jerusalem His capital city. He will rule over the whole earth. He will be King of Israel and give to the Jews the land promised to Abraham’s descendants. God always keeps His promises. According to a handful of teachers about Bible prophecy the series of lunar eclipses that started last year is a sign from God that something significant is about to happen in the world, probably in relation to Israel. This predication is based on the idea that when the Bible says the moon will be turned to blood it is referring to a full lunar eclipse, also called a blood moon. A quick online search of the Bible reveals the phrase blood moon is not found anywhere in the Bible. The phrase is a modern one that possibly originated in the 1800’s. Though the blood moon is not found in the Bible, the question still remains, does the “moon be turned to blood” refer to a full lunar eclipse or a special series of eclipses? The moon being turned to blood is most likely not intended to teach that the moon will change its substance to become actual blood. Instead, the phrase seems to be describing an event which causes the moon to take on a deep red color like that of blood. Though the phrase blood moon is descriptive of the appearance of the moon during the lunar eclipse, the assertion that it is descriptive of a lunar eclipse tetrad is uncertain at best. The coloration of the moon during a full eclipse is not that different from the deep orange of a moonrise occuring just after sunset. Why are harvest moons not on the prophetic booksellers table? Despite the efforts of modern authors, no evidence exists to suggest that the writers of the Bible or the original readers would have understood “moon turned to blood” in terms of an eclipse. We cannot today make a passage mean something it never meant. The Bible teaches that something will happen which will cause the moon to take on a deep crimson hue. To understand if this most recent series of blood moons is a fulfillment of the Biblical prophecies, one must look to the Bible. The reference in Joel 2 declares the moon being turned to blood will be associated with the sun be darkened and wonders of fire and smoke in the skies. Revelation 6 expands on these events teaching that at this time the stars will begin to fall from the sky. Most importantly for our understanding, and most destructive to the theories devised by blood moon speculators, is the timing of the moon being turned to blood. Revelation 6 describes these horrible cosmic events as taking place during a time called The Tribulation. The Tribulation is a seven year period of intense suffering unlike anything ever seen before. The catastrophes of that time will not be natural but supernatural. The violence and destruction of those seven years will be unmistakably different from the earthquakes, hurricanes and tragedies happening today. The moon will not be turned to blood before the tragedies begin but in the middle of a series of horrific events. Since the world is not engaged in another world war, and since the world is not stricken with near universal famine, and since a quarter of the earth’s population has not been struck down in painful death, and since the sun has not been blotted out of the sky, and since the world has not been shaken with an earthquake that moves the mountains and islands out of their place, and since the stars are not falling out of the sky, then I can say with Biblical certainty these lunar eclipses are not fulfillment of Biblical prophecy. (Revelation 6:1-17) The moon being turned to blood is a horrible happening preceding the day of Jesus. It is not a sign given for speculation, but one part of the wrath of God being poured out on mankind. God has already communicated in His Word all that mankind needs to know about the return of Jesus. He is not using eclipses to reveal special information about the end of the world. Will everything change as one author foretells? I have no doubt that significant events will continue to happen in the years ahead. Those looking for proof of their conjectures will find ample evidence in the normal wars, catastrophes and political upheavals of the world. Those looking for Biblical truth will find the lunar eclipse is a sign that the celestial bodies are still spinning as God has ordained. When the moon is turned to blood mankind will know already know something is happening and God’s wrath is being poured out on humanity.